Today, my father would have been one hundred years old. My grandfather was in France at the time his son was born, serving with the 75th Field Ambulance. I still have the telegram he received two days later and carried in his wallet for the rest of the war: ‘A boy. Christine doing well.’ It was nine months before he was drawn for leave and came home unexpectedly on New Year’s Eve. The local paper reported that ‘it was a sight for the gods to see its khaki father proudly carrying his lusty though youthful son through the village last week’. Within a few days he was back in France. 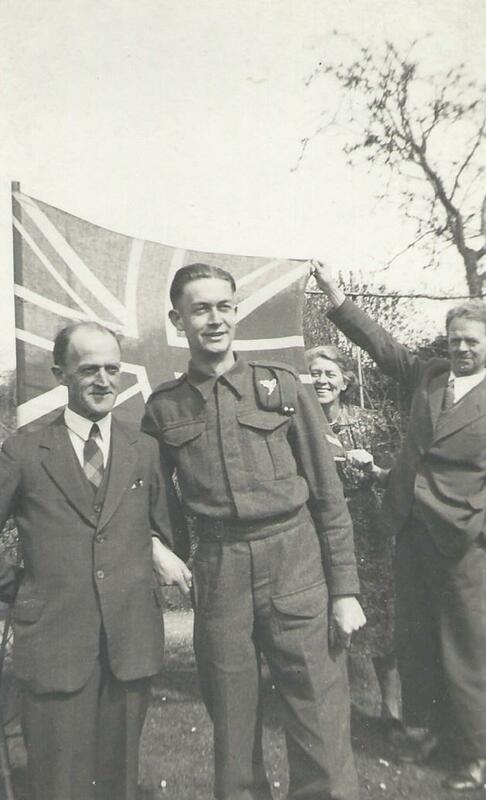 In 1940 it was my father’s turn to join the army. I only recently found this photo, which seems to mark the occasion. Everyone is putting a proud and brave face on the event, though my grandfather (on the left of the picture) looks a little more doubtful, as he well might after fours years’ experience of treating the wounded behind the trenches. No-one at that moment knows what the war might have in store for my dad. He is twenty-four. A year later, his REME unit embarked from Liverpool on the merchant ship, Sydney Star, and it was not until a large convoy had assembled and begun to move south that even the ships’ captains were told that their destination was Malta. Malta was an island of huge strategic importance and the Axis powers were determined to starve it of resources; many ships were lost on the route. On the morning of July 23rd the convoy was attacked in the narrow channel between Sicily and Tunis, and the assaults continued through the next twenty-four hours. At 3.00 a.m. my father heard a tremendous explosion, as Sydney Star was holed below the waterline by a German U-Boat. He and all the troops aboard were evacuated in the pitch darkness to another ship, Nestor, which entailed walking across a plank between the two decks as they rose and fell in the heavy seas. The next day they arrived in Valetta, and Sydney Star herself belatedly limped into harbour safely. The following three years were extremely tough both for the Maltese and the Allied troops stationed there. Continual bombardments destroyed most of the island’s buildings, and subsequent convoys struggled even harder to get through so that there was a constant shortage of food and other essential supplies. And, of course, there was for much of the time the threat of imminent death as the Luftwaffe regularly attacked three times or more each day (usually at mealtimes, my father recalled). Everyone had frequent bouts of a local strain of dysentery known as ‘the Malta Dog’ (‘is it barking?’ was the jocular inquiry). Suffering from such malnutrition that his teeth became loose, my father had to have them all removed by an army dentist. He came back home in 1944. This professional photograph taken of him in 1948 seems to me now a way of re-asserting his personal dignity after the indignities of the siege of Malta. He returned to his earlier job as a bookseller, managing shops for Wymans (later absorbed by John Menzies); he married, and I and my two sisters were born. 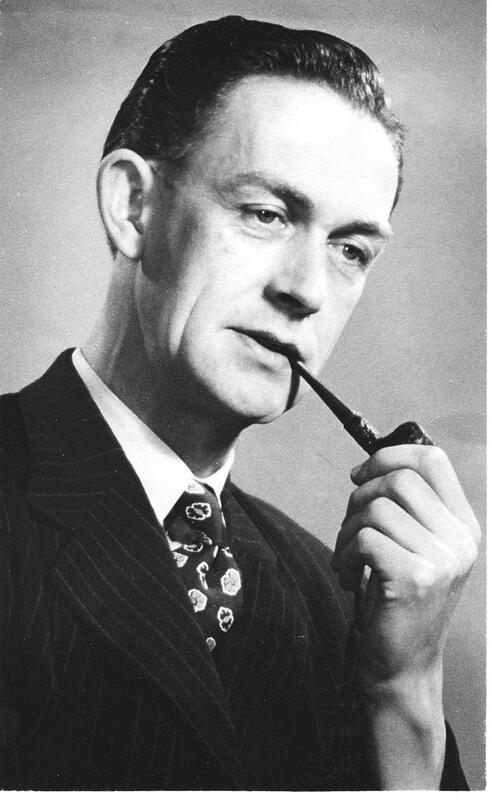 In 1963 he parted company with Wymans and was obliged to take a job as accounts clerk at the local factory in Abergavenny, where we then lived, and he worked there until his retirement. He rose to the position of Budget Controller and was highly respected in the firm, but never advanced further because he had no formal accountancy qualifications. At the age of 65 he started work in a local independent bookshop, selling second-hand books and titles about the countryside and local history, and he continued to do this until he was in his eighties; he enjoyed it much more than the accounts department, and when asked his occupation always proudly answered ‘bookseller’. In his later years he spent a lot of time hill walking around Abergavenny, being especially fond of the Llanthony Valley and the hills toward Hay on Wye. Apart from a couple of short trips to France and Belgium just after the war, he never left the UK again. He never went on an aeroplane, never learnt to drive nor owned a car, never owned a house. He never had much money but was never in debt; he drank little, and in his forties he gave up the heavy cigarette habit that I assume he had begun in the war. I do not know if he was dissatisfied with his life, more than any of us are. I have the impression that after his experiences on Malta, he was mostly content to be on dry land, to have enough to eat, to pass his days without the fear of imminent destruction. That’s what I like to imagine. He died just short of his 93rd birthday. He specified three hymns that he wanted at his funeral; one of them was ‘For those in peril on the sea’.